The second leg of the BBL08 double header on Saturday sees the ladder-leading Hobart Hurricanes travel to Canberra to take on the Sydney Thunder at Manuka Oval. The Thunder need to record a big win here to jump the Heat after their devastating win against the Stars, while the Hurricanes have top spot all looked up after defeating the Renegades on Thursday night. Last time these two teams played was one of the matches of the season, with the Hurricanes chasing down the Thunder’s 193 with 5 balls to spare thanks to 85 from Matthew Wade and a late cameo from George Bailey. The Thunder have brought back the big guns for this clash, with Usman Khawaja, Pat Cummins and Kurtis Patterson all returning from Australian duties and Matt Gilkes returning from injury. Arjun Nair, Jono Cook, Baxter Holt and Jason Sangha have all been left out. The Hurricanes retain the same 13 from Thursday night’s game, with James Faulkner given more time to rest his problematic knee. Manuka Oval in Canberra only hosted the one match last season which saw the Melbourne Renegades successfully defend 189 against the Thunder by nine runs in a high scoring clash. 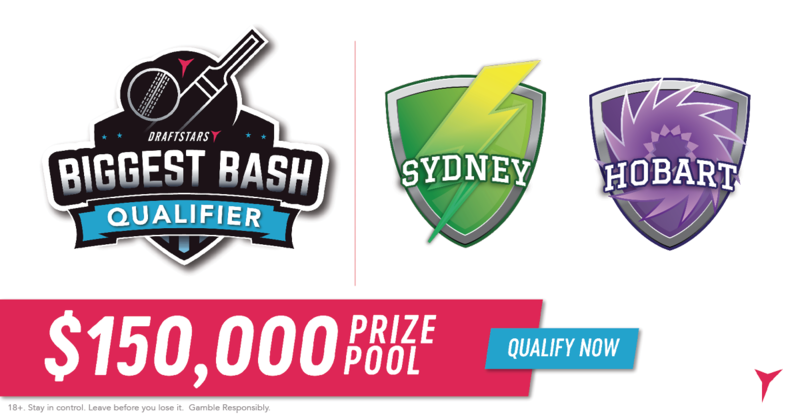 The match featured a massive 20 sixes – the fourth highest tally in a match in the past three seasons of the Big Bash – so those who can take the aerial route will get every opportunity to do so. In the only game there this season the Thunder made 181 and the Stars could only manage 6-74 off 8 overs in reply before rain forced an early finish. While only a short sample, Manuka Oval is the highest scoring ground used in Big Bash competition with the point distribution strongly leaning towards the batsmen (stats from our BBL Resources Points Against page). What more can you say about the Hurricanes opening partnership of D’arcy Short ($26,200) and Matthew Wade ($22,600)? Wade was the dominant one with the bat in their win over the Renegades, scoring 115 points from his rapid 58, but while Short only scored 28 runs it was his 2/20 off 4 overs that resulted in a massive 143 fantasy points. Playing both together will take up nearly half of your total salary, but their best is good enough to return value and with a couple of severely underpriced players available you can do it. Usman Khawaja ($12,000) was devastating last year in this format but hasn’t played this season due to extensive Australian commitments. Assumedly he will be picked to play here and if so is clearly underpriced for both his ability and output from last season. He will be popular at this price but he is very capable of a match-winning score so exposure to him is a must. Shane Watson ($13,000) has only made two big scores in the whole BBL08 season in what must be said has been a disappointing return, but if he is ever going to make another big score then what better time than now. On the highest scoring ground in the competition, against a Hurricanes bowling attack which allows more points to opposition batsmen than any other, he will get every opportunity at the top of the order. He is easy to play at this price point for that reason. Another player returning from a long Australian summer is Pat Cummins ($8,000) and if he takes his place in the team it is hard to avoid playing him at the minimum salary. His bowling is obviously as good as anyone in the country and past BBL seasons have also showcased his hitting power down the order when required. It won’t take much to return value at this price and his upside is extraordinary, especially if he gets a look with the bat in the latter overs. Qais Ahmad ($14,000) was quite impressive in his first outing for the Hurricanes with a pair of wickets and only some late hitting took away his economy bonus. What was evident was how hard he was to pick up initially with his unique style and that no doubt brought about the downfall of Australian captain Aaron Finch. He is a bit more expensive here but he showed enough on debut to suggest he is going to have a lot of success in BBL action. Daniel Sams ($14,900) is a genuine all-rounder offered up at a very reasonable price. His form has tapered off to a degree after a blistering start to the season but he has still gone above 65 fantasy points in two of his past four games. He has been inconsistent in recent times but he can score in all four categories and deserves a place in suitable lineups.